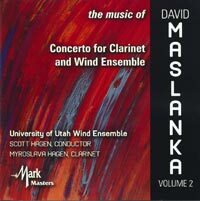 DAVID MASLANKA (b.1943): Concerto for Clarinet and Wind Ensemble (First Recording), Morning Star, Liberation, On This Bright Morning. Description: We know what to expect of Maslanka by now, and this disc will not disappoint. Bold, tonal neo-romantic works, expertly crafted to make the most of the coloristic and dynamic potential of the wind orchestra, featuring references to Bach, chorales, hymns, plainchant, and with an overarching message, explicit or implied, of spiritual import. The twenty-five minute concerto is in two movements, 'Lamentation' and 'Dance'. The first is free and rhapsodic, introverted in character, reflective and sad. The second is exultant, propulsive and organised more strictly in clearly delineated sonata form. The composer's melodic invention is memorable and delightful; a modal tinge to the sinuous melodies suggests some slight middle-eastern or mediterranean influence, and the solo writing is of a very high level of virtuosic accomplishment (the clarinet was the young composer's instrument). Liberation is a setting of the plainchant Libera me, intoned in unison and then developed and illuminated in three fully orchestrated sections illustrating the prayerful entreaty, day of wrath and hope of redemption for the departed, in imposing romantic harmony and textural massiveness. Morning Star is an exuberant and optimistic overture, more straightforwardly optimistic than the determined, energetic On This Bright Morning, a post-minimalistically ostinato-driven work which has its reflective side and suggests the victory of hope over adversity and conflict. Myroslava Hagen (clarinet), University of Utah Wind Ensemble; Scott Hagen.